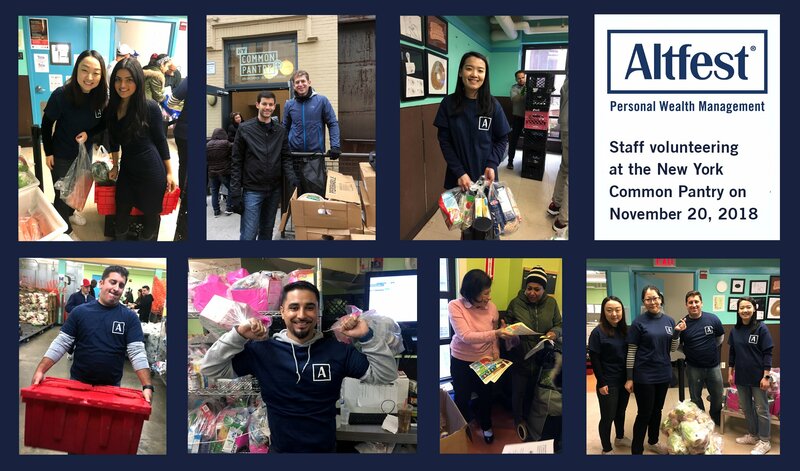 As we do every year, a group of Altfest employees volunteered at the New York Common Pantry this Thanksgiving week to help give away turkeys and other traditional holiday foods to less fortunate New Yorkers. The New York Common Pantry was founded by Karen Altfest in 1980 with the mission of reducing hunger throughout New York City. In 2017, over 62,000 people were served through its programs, and this year, Thanksgiving packages will be distributed to nearly 2,700 households. We pride ourselves on continuing the Altfest legacy of philanthropy and helping others, and are thankful this holiday season for our meaningful relationships with clients, partners and colleagues. If you are interested in volunteering at The New York Common Pantry, you can learn more on its website here.